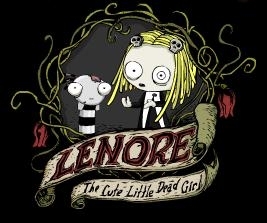 Do u think Lenore is cute? la scelta dei fan: Yes!! !Shes so adorable!!! Would te unisciti the Lenore and Ragamuffin fanclub? Do te think Lenore and Ragamuffin (his vampire self) would make a cute couple, if she was older? la scelta dei fan: Yes, they would be so cute together! Is there anywhere in Delta, BC where I can get some of her comics? Lenore: *stands da mr gosh's grave* u look kinda like a fagiolo bag..
Mr gosh: well some parts of me ARE beanbags. a comment was made to the pop quiz question: Who created Lenore? What is the name of the Vampire that Lenore brings back da accident when she tries to fix a bambole arm and pokes herself? That's Easy! Jhony The Homocidal Maniac!